Well that was fast! After I resubmitted the site October 25th at 7am and I checked again this morning at it is back in the index. This is after Jennifer Convertibles Web Site Hacked & Delisted In Google.com, I decided not to ask for favors and used the Google Reinclusion request within Google Webmaster Central. 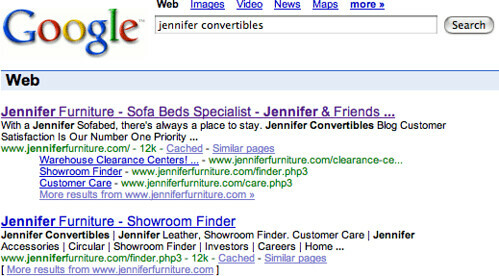 Currently, ranking number one for Jennifer Convertibles like it should be. No pages from your site are currently included in Google's index due to violations of the webmaster guidelines. Please review our webmaster guidelines and modify your site so that it meets those guidelines. Once your site meets our guidelines, you can request reinclusion and we'll evaluate your site. No pages from your site are currently included in Google's index. Indexing can take time. You may find it helpful to review our information for webmasters and webmaster guidelines. But when I look, it seems as if some pages are included, even spammy pages - which lead no where right now. 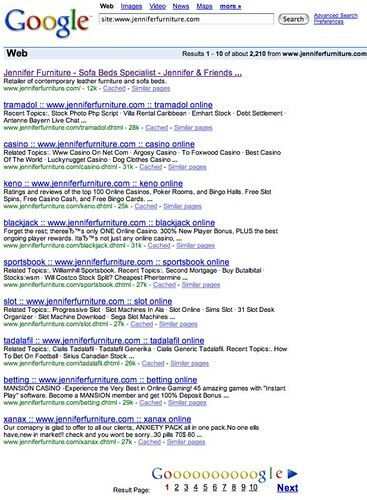 Conduct a site:www.jenniferfurniture.com and you will see those old spam pages that were hacked in. Kudos to Vanessa Fox and Matt Cutts of Google for making Google Webmaster Central an efficient place. FYI - it would be cool if you have a tracking number and status within the Webmaster Central Reinclusion request area - like a simple ticketing system, so you know the details. Also see Time Line To Get Reincluded in Google With Reinclusion Request. No one expedited your request. I checked later just to make sure that it was processed in the order that it arrived in the queue. However, you should be aware that things like a hacked site or hidden text are among the easiest to check for reinclusion. More serious webspam incidents can take longer for reinclusion to happen, and we do not guarantee reinclusion in response to each request.